Snoring is caused by a partial obstruction of your airway. As you fall asleep, muscles in your soft palate, throat and tongue relax. If those muscles relax too much, they can fall into the back of your throat and partially obstruct your airway. As you breathe, the air passing through the airway causes those relaxed soft tissues to vibrate. And that vibration creates the harsh, buzzing sound you make when you snore. Fortunately, there are devices that can help to alleviate your snoring almost immediately. So without further ado, here are the top five best anti-snoring devices. Many respected doctors, dentists, sleep specialists and organizations (like the American Academy of Dental Sleep Medicine) recommend MAD mouthpieces as an effective way to alleviate or even eliminate snoring. And over a decade of research studies and clinical testing have proven just how effective “stop snoring mouthpieces” can be. The way they work is simple. When you wear the mouthpiece at night, it gently pulls your lower jaw forward. That opens the airway so that it is not partially blocked anymore and the snoring stops instantly. Back in the day you needed your dentist to custom make you one at a huge cost. These days there are many effective one size fits all MAD’s available at a fraction of the cost. Below are our top 5. Use coupon code "TSW10" to get ten percent off. Ships internationally for just $9.99. Receive in 7 to 10 days. The Snorerx mouthpiece is FDA approved and proudly manufactured in Southern California. 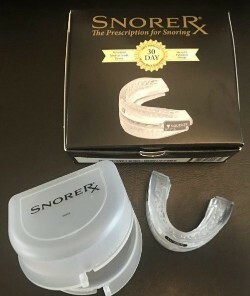 Similar to the other mouthpieces, Snorerx works by gently pulling the lower jaw forward to open the airway and stop the snoring. What makes Snorerx different from the rest is that it is fully adjustable in 1mm increments. Maybe you only need a small adjustment to get your airway open at night,or maybe you need a larger adjustment. 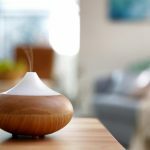 With Snorerx you can get that perfect setting relatively quickly. Snorerx uses boil and bite technology to create a custom fit for your mouth. No need to have your dentist create an expensive custom fit mouthpiece. Many dental proffessionals also recommend Snorerx to their patients. Here’s what Gary Ewing, President of the San Diego dental lab has to say about Snorerx. So far Snorerx sounds great doesn’t it? Let’s see what their customers have to say. We found a lot of positive reviews for Snorerx. We find that the product works well for the majority of people. Here’s what one customer had to say. “I was previously using a custom snoreguard/mouthpiece made by my dentist which, while it worked well, was close to $750 and was constructed so delicately that the side pins that hold the bands on, snapped two times in one year, and I had to wait over a week and pay for the repairs. When it snapped a 3rd time, I decided that it was finally time to try an alternative solution. After much web research,I decided on SnoreRx and I must say that I have not been dissapointed. The initial process of heating and molding it to my mouth was quick and easy and I find it relatively comfortable and easy to sleep with. In addition, unlike to custom one I had, this one is not dainty,and can be cleaned with a toothbrush without fear of breakage. And yes…it has been just as effective in eliminating my snoring as the custom one,for a fraction of the price. Some people complained that the mouthpiece is a bit too big for them. If you have a smaller mouth, then we suggest to rather try the VitalSleep. Snorerx comes with a 30 day money back guarantee and we feel that it could be very well worth your while to give it a try, risk free. Visit their site here for more info. Use coupon code TSW10 to get 10% off. There are a lot of good anti-snoring devices on the market, but coming in at close second is the VitalSleep Anti-Snoring Mouthpiece. Not only is it available for a great price, it has some of the lowest return rates of any of the picks on our list…which goes to show how satisfied customers are with this anti-snoring device. 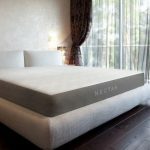 There are hundreds of thousands of customers around the world who can now sleep through the night thanks to VitalSleep. Because this device is so easy to use, you can be enjoying the same benefits on the day your VitalSleep mouthpiece arrives. 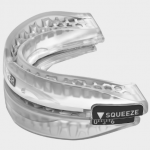 The VitalSleep Anti-Snoring Mouthpiece gently holds your lower jaw forward to keep your airway open and unobstructed. The improved airflow will alleviate your snoring and allow you to breathe more easily and naturally while you sleep. The VitalSleep mouthpiece is customizable and moldable, and will contour to fit comfortably, no matter the size or shape of your mouth. It is also available in two sizes. The regular size is recommended for most male customers. And for women, there’s the small sized mouthpiece, which is a little more compact. 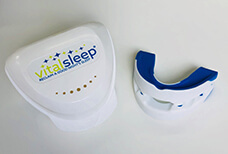 The VitalSleep mouthpiece is fully adjustable. In less than five minutes, you can make small micro-adjustments to the mouthpiece until it’s just right for you. If you want to increase your airflow, you can increase the size of the opening. Or you can decrease the size of the opening if comfort is an issue. Many customers say the VitalSleep mouthpiece is the most comfortable anti-snoring device they’ve ever tried, and that’s largely due to its patented design and flexible frame. The VitalSleep is also sleeker and more compact than some other mouthpieces, so it won’t feel as bulky in your mouth. With some anti-snoring mouthpieces, it can feel like your jaw is locked in place. But the VitalSleep allows you to move your jaw from side-to-side, so there’s less stress on your jaw. And the position you sleep in doesn’t matter. Most snorers are advised to sleep on their sides to prevent snoring. But, with the VitalSleep Anti-Snoring Mouthpiece, you won’t snore even if you sleep on your back. 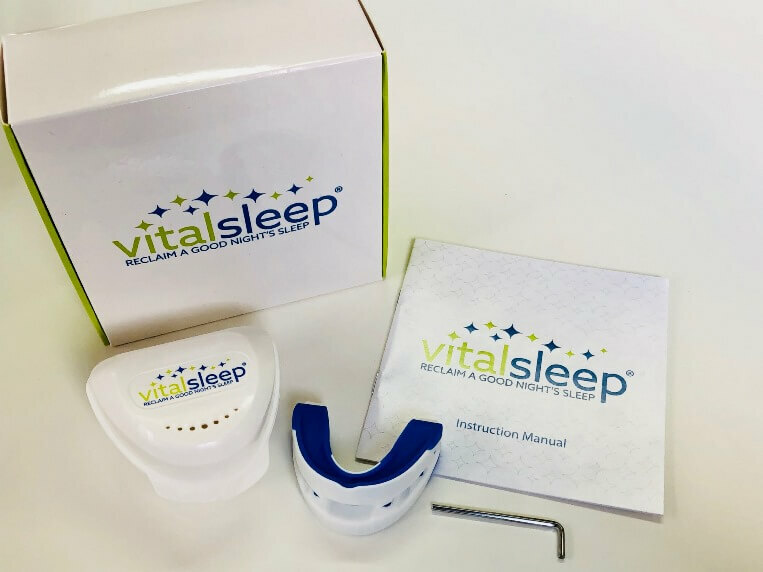 Classified as a medical device in the USA, the VitalSleep Anti-Snoring Mouthpiece has been cleared by the FDA as a safe and effective anti-snoring device. It is made of non-toxic, medical grade materials, and is both BPA and latex free. Not only is the VitalSleep an effective anti-snoring device, it’s also affordable. You can get one mouthpiece for just $59.95, or two for $99.95. There’s also free same-day shipping. If you place your order by 3 pm Eastern Time, your order will ship that day. This means you’ll get your VitalSleep mouthpiece, and start enjoying the benefits of using it, as soon as possible. 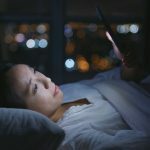 If you live outside the US, VitalSleep ships internationally for just $9.99. Place your order, and your mouthpiece will arrive in about 7 to 10 days. And let’s not forget the 60-Day, 100% Money Back Guarantee. If you aren’t satisfied with the VitalSleep mouthpiece, just return it within 60 days and you’ll get a refund. There’s also a 1 year warranty. While the warranty doesn’t cover lost or stolen items, VitalSleep will replace your mouthpiece for almost any other reason for up to 1 year from the original purchase date. All you have to do is send them an email and make a replacement request. The VitalSleep Anti-Snoring Mouthpiece has gotten some great customer reviews. One man said that he used to only get about 2 hours of sleep per night. But since he’s started using the VitalSleep, he gets an amazing 6 to 7 hours of sleep every night. As a result, he can now get through the day without falling asleep. Another user said this is the most comfortable anti-snoring device she has ever tried, and she’s tried a lot of them. Thanks to the VitalSleep mouthpiece, both she and her husband can now sleep through the night. And according to another user, his snoring would wake him up every couple of hours. But within days of starting to use the VitalSleep Anti-Snoring Mouthpiece, his snoring stopped. Now, not only is he able to sleep through the night, but his wife can too. See the VitalSleep Anti-Snoring Mouthpiece here. Save $5 on ZQuiet when you buy today! Use coupon code WSPZC5 to save. Over half a million satisfied customers have used this anti-snoring mouthpiece, and have enjoyed many peaceful nights of sleep as a result. In fact, the ZQuiet is so effective, many customers say they noticed a difference the first night they used it. The ZQuiet mouthpiece was designed and created by a dentist. He used the same methods dentistry has perfected to fit dental patients with comfortable custom appliances, including appliances designed to help alleviate snoring. But while those appliances can require costly and time consuming visits to the dentist’s office, the ZQuiet doesn’t require any special fitting or adjustment. And since there’s no molding required, you can use the ZQuiet right out of the box. The ZQuiet is a small, soft mouthpiece that gently brings the lower jaw forward. This opens the airway so air can pass through freely and without obstruction. So when you order from ZQuiet, you get not one but two mouth pieces, one of which adjusts the jaw a little more than the other. First you can try Comfort 1, the mouthpiece that advances the lower jaw the least. 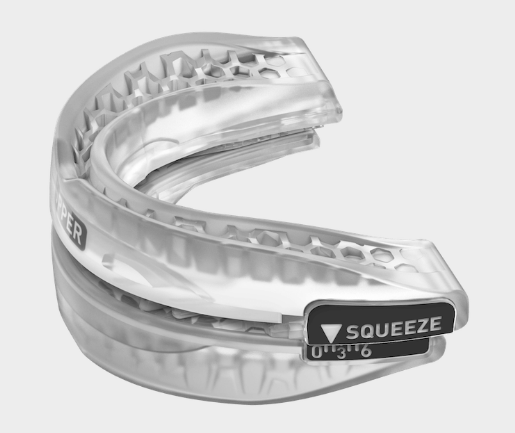 If that mouthpiece doesn’t give you the results you want, you can try Comfort 2, which advances your jaw a bit more. With its patented design and Living Hinge Technology, the ZQuiet is both effective and comfortable. 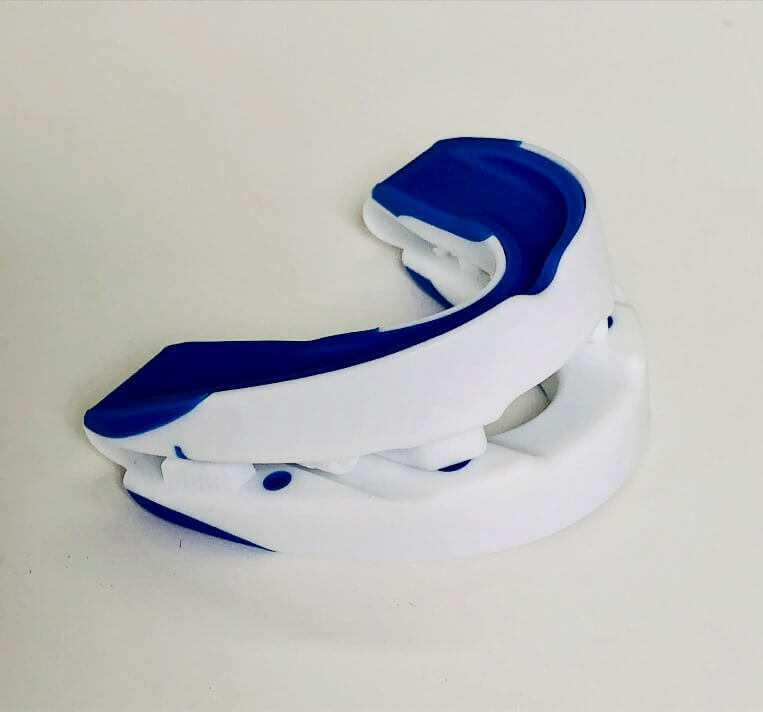 This mouthpiece allows you to freely and naturally move your jaw. And you can sleep with your mouth open or closed and still enjoy the benefits of using the ZQuiet. And the position you sleep in doesn’t matter. Whether you sleep on your side or your back, the ZQuiet keeps your airway open and prevents you from snoring. The ZQuiet mouthpiece is guaranteed to work. And you can give it a try at a greatly reduced price compared to having your dentist making you a custom one. 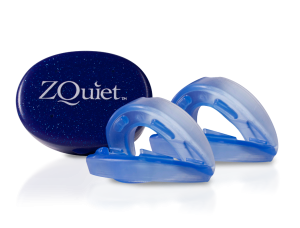 The ZQuiet mouthpiece has been designated by the FDA as a Class II medical device. Not only is the product made with safe materials that are FDA approved, it has proven its effectiveness as an anti-snoring device. The ZQuiet has also gotten plenty of great reviews from happy customers. According to one user, his snoring was so bad his wife couldn’t sleep in the same room at night. His kids asked him to keep the bedroom door closed when he was asleep. But since he’s gotten the ZQuiet, he and his wife can sleep in the same room again. And he can leave the bedroom door open without disturbing his kids. 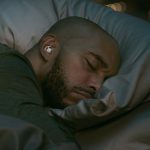 Another user says the ZQuiet is the best solution to snoring he has ever found. Since he’s started using this mouthpiece, his snoring has been virtually eliminated. One reviewer, whose husband snores, sang the ZQuiet’s praises. She says that, thanks to this mouthpiece, her husband falls asleep within minutes of going to bed. Because she no longer has to spend her nights poking him to get him to turn over onto his side, she is able to sleep better too. 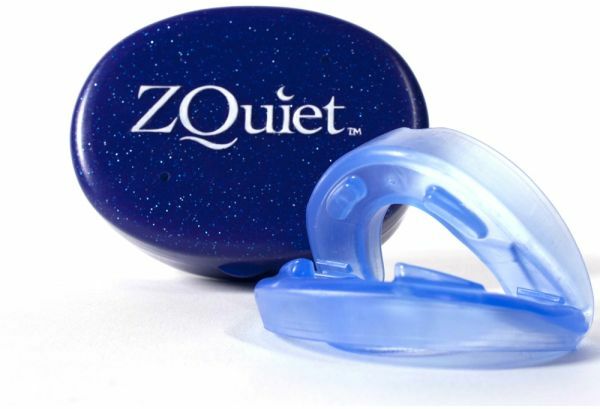 See the ZQuiet Anti-Snoring Device here. There are thousands of customers around the world who sing the praises of the Good Morning Snore Solution. The Good Morning Snore Solution was developed by a doctor with safety and effectiveness in mind. Not only does it prevent or alleviate snoring, it can also help those suffering from mild to moderate sleep apnea. And many doctors, as well as some of the most respected sleep clinics worldwide, have recommended the Good Morning Snore Solution to their patients. The Good Morning Snore Solution is a Tongue Stabilizing Device (TSD) that gently moves the tongue forward. This keeps your tongue from falling back into the back of your throat and obstructing your airway while you sleep. And if there’s nothing blocking your airway, you won’t snore. The Good Morning Snore Solution is a universal fit device. It was designed to fit any user, no matter the size or shape of their mouth. And no adjustment is required. In fact, you don’t have to cut, trim or heat this mouthpiece before you can start using it. The Good Morning Snore Solution is soft and flexible, so it’s comfortable to use. And it doesn’t adjust the jaw, so there is no jaw pain or discomfort. If you’ve tried mouthpieces that do adjust the jaw, and didn’t find them comfortable, this device might be a better alternative for you. The effectiveness of the Good Morning Snore Solution has been clinically proven. In May of 2008, a study published in the Journal of Sleep and Breathing showed that the Good Morning Snore Solution can significantly decrease snoring. Most of the people who participated in the study wanted to keep using the mouthpiece because it worked so well. The Good Morning Snore Solution is registered as a Class I medical device by Health Canada, the European Commission, and the ARTG. And it’s registered as a Class II medical device by the FDA. The Good Morning Snore Solution is available at a variety of price points. You can get one mouthpiece for $99.94, or two for just $149.94. There’s also a 30-Day, 100% Satisfaction Guarantee. If you try the Good Morning Snore Solution and aren’t satisfied for any reason, you can return the mouthpiece for a full refund of the purchase price. And if you live outside the US, the good news is that the company ships internationally. 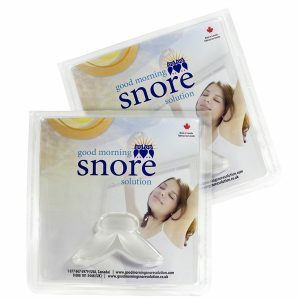 The Good Morning Snore Solution has received many positive reviews from customers. One reviewer was such a fan after a year of use that, when he lost his mouthpiece while on vacation, he immediately ordered a replacement. He was also thrilled by how fast his new mouthpiece was delivered. Like many users of the Good Morning Snore Solution, one reviewer really appreciated that they weren’t keeping their partner awake with their snoring anymore. And they were equally pleased by how much more soundly they were able to sleep themselves. And according to a reviewer who also suffers from mild sleep apnea, the Good Morning Snore Solution reduced her snoring by at least 85%. See the Good Morning Snore Solution here. 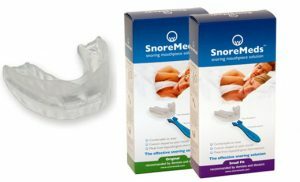 SnoreMeds is one of the most popular “stop snoring devices” on the market today. And it has been proven effective by customers around the world. In fact, countless sleep disorder specialists have recommended this mouthpiece to their patients. No product will work for everyone. But the SnoreMeds mouthpiece has successfully helped 85% of the snoring sufferers who have tried it. The SnoreMeds mouthpiece is easy to fit and easy to use. This anti-snoring device gently holds your lower jaw, tongue and soft pallet forward to keep them from obstructing your airway. 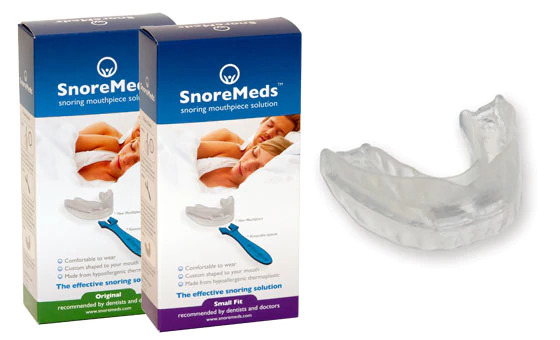 SnoreMeds anti-snoring mouthpieces are available in two sizes. The Original Fit mouthpiece is recommended for men. And the Small Fit mouthpiece, which is narrower and more compact, is recommended for women. The SnoreMeds mouthpiece is soft and comfortable. In fact, many say it’s one of the most comfortable anti-snoring devices they have ever used. Some anti-snoring mouthpieces don’t allow you to breathe through your mouth while wearing them. There are 3 types of snorers and each need their own treatment. Take our 40 second test to see what type you are. But you can with the SnoreMeds mouthpiece. This comes in handy if you’re suffering from a condition that prevents you from breathing through your nose, like a cold, allergies, or other sinus problems. The SnoreMeds mouthpiece also has holes that will prevent saliva from building up in your mouth while you sleep. SnoreMeds mouthpieces have been cleared by the FDA, so you know they’re both safe and effective. The FDA has also cleared this device as an effective treatment for mild to moderate cases of Obstructive Sleep Apnea. Additionally, SnoreMeds mouthpieces are latex free and BPA free. SnoreMeds gives you a variety of pricing options. With the Single Pack, you get one mouthpiece for $50.95. With the Double Pack, you get two mouthpieces for $70.95. And with the Multi-Pack, you get four mouthpieces for $98.95. SnoreMeds also offers a 45 day money back guarantee on the Single Pack mouthpiece. You can try the mouthpiece out for over a month. If you’re not happy with this anti-snoring device for any reason, just return it and you’ll get a refund. The SnoreMeds mouthpiece has been getting great reviews from customers. One reviewer called the SnoreMeds the best anti-snoring appliance she has ever used. It took some getting used to at first, but the results were well worth it. Another reviewer said something similar. The SnoreMeds took some getting used to early on. But, after several months of use, she was more than happy with the device, and how well it worked. According to another user, she loved her first SnoreMeds so much that she is going to order another one. And the mouthpiece has so greatly improved the quality of her sleep that she’s recommended the device to many of her friends. Another reviewer said that, due to allergies, he has snored for just about all of his life. But, since he’s started using the SnoreMeds mouthpiece, he’s stopped snoring. 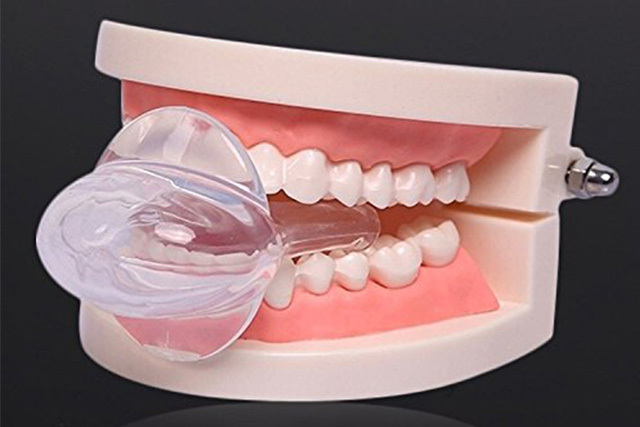 See the SnoreMeds Anti-Snoring Mouthpiece here. Do mouthpieces really work to stop snoring? There has been lots of studies done on the effectiveness of anti snoring mouthpieces. They are also called Mandibular Advancement Devices (MAD). These mouthpieces are designed to gently move your lower jaw forward, which opens your airway and stop the tissue in the back of your throat from vibrating and creating the snoring sound. These days there are lots of options on the market and they are affordable. You don’t need to pay thousands for a custom MAD from your dentist anymore. For some people their snoring originates from not being able to breath through their nose properly. If that’s the case, a MAD mouthpiece won’t work. There are a number of ways to deal with snoring that originates from the nose. Nasal dilators, nasal sprays and Neti pots are commonly used. Does Zyppah work for snoring? Yes the Zyppah mouthpiece does work for snoring. It’s one of the many devices that’s on the market today. We suggest to rather go with one of the mouthpieces above as they are a bit more affordable and very effective. Do anti snoring nasal sprays work for snoring? If your snoring originates from the nose, meaning that you struggle with nasal breathing due to nasal stuffiness, allergies, deviated septum or some other reason then nasal sprays, nasal dilators or a Neti pot could work well for you. Here are the answers to some of the most common questions about anti-snoring mouthpieces. What is an anti-snoring mouthpiece? An anti-snoring mouthpiece is a dental appliance designed to stop snoring. Snoring is often caused by a narrow or partially blocked airway. Anti-snoring mouthpieces prevent airway obstructions and open up the air passage. Anti-snoring mouthpieces are among the most effective snoring remedies. Many doctors and dentists recommend these devices to patients who snore. What are the different types of anti-snoring mouthpieces? Two of the most popular devices designed to stop snoring are Mandibular Advancement Devices (or MADs) and Tongue Stabilizing Devices (or TSDs). Both of these anti-snoring mouthpieces open up your airway, and attempt to prevent air passage obstruction. But they work in different ways. What is a Tongue Stabilizing Device? A Tongue Stabilizing Device, or TSD, moves your tongue forward or down, and then holds it in place. When the tongue is stabilized in this way, it can’t fall back into the throat and partially obstruct the airway. Moving the tongue forward also creates more space in the air passage. And the more open your airway is, the less likely it is that you will snore. What are the pros and cons of using a TSD? While Tongue Stabilizing Devices work for many people, they don’t have as high a success rate as Mandibular Advancement Devices. When you first start using a TSD, you might experience unpleasant side effects like excessive salivation. The device might leave the tip of your tongue sore. And you might find the position a TSD holds your tongue in hard to get used to. Luckily, it doesn’t take long to get used to wearing a TSD. Any unpleasant side effects usually disappear after a week or so of regular use. And, unlike MADs, TSD’s are unlikely to cause jaw pain or tooth shifting. Mandibular Advancement Devices work by moving the lower jaw forward, or advancing it, which creates more space in the airway. A MAD also holds the tongue forward, so it can’t fall back into the throat and partially obstruct the air passage. MADs are the most popular type of anti-snoring mouthpiece. What are the pros and cons of using MADs? It can take a week or more to adjust to sleeping with a MAD in your mouth. You might experience jaw pain or discomfort while wearing the mouthpiece, and your jaw might be sore for an hour or so after you remove the MAD. MADs can also cause excessive salivation. Other possible side effects include tooth pain and tooth shifting. Wearing MADs can also contribute to TMJ. On the other hand, MADs are extremely effective anti-snoring devices. It’s estimated that more than 80% of people who use MADs either stop snoring altogether, or experience a decrease in snoring frequency and severity. Can people with dental issues use anti-snoring mouthpieces? If you have missing teeth, wear dentures, or have other dental issues, you might not be able to use a standard MAD. However, there’s a good chance you can use a TSD. A Mandibular Advancement Device uses your lower teeth to move the lower jaw forward. Your lower teeth also help to hold the device in place. If you have a lot of missing lower teeth, there might not be enough for the MAD to hold on to. And dentures might not be strong enough to anchor a MAD. A Tongue Stabilizing Device stabilizes your tongue, a job that doesn’t involve your teeth. So even if you wear dentures or have missing lower teeth, a TSD will probably work for you just fine. 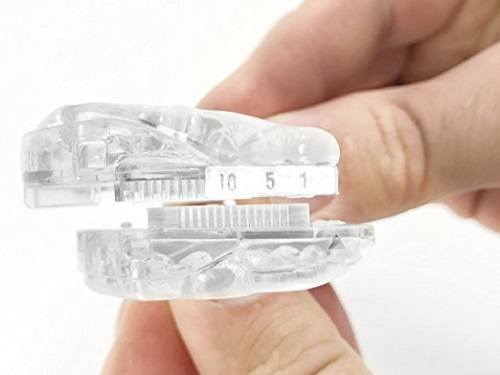 There are MADs that can be used by denture wearers. But these are the exception rather than the rule. How long will it take for an anti-snoring mouthpiece to stop my snoring? It’s possible that an anti-snoring mouthpiece will stop your snoring immediately, on the very first night you use it. However, it could also take a few days for you to see noticeable results. Do I need a doctor’s prescription to get an anti-snoring mouthpiece? The US Food and Drug Administration classifies some anti-snoring mouthpieces as Class II medical devices. And, technically, those do require a prescription from a doctor. However, these mouthpieces can be sold legally and legitimately without a prescription. The requirement is that the supplier provides enough instruction to enable a buyer to use the device properly. Should I talk to my doctor before using an anti-snoring mouthpiece? b) any snoring remedies you want to try, like MADs or TSDs. Snoring is often a sign of a more serious medical condition, like sleep apnea. And your doctor can determine whether or not a serious medical condition is causing you to snore. Even if your snoring isn’t caused by another medical condition, your doctor or dentist might be able to recommend a good MAD or TSD to you. After all, many medical professionals recommend anti-snoring mouthpieces to patients who snore. After you’ve bought an anti-snoring device, consider showing it to your doctor or dentist. Since they are familiar with your specific medical situation, they can let you know if a particular mouthpiece isn’t safe for you to use. Can anti-snoring mouthpieces be used to treat sleep apnea? There are MADs specifically designed to treat Obstructive Sleep Apnea (or OSA). MADs used to treat sleep apnea advance the jaw, just like anti-snoring MADs do. So it stands to reason that such an anti-snoring device could help someone who suffers from OSA. In fact, some snoring mouthpieces have been approved by the FDA for treating mild to moderate sleep apnea. But if you suspect you have sleep apnea, trying to deal with it on your own with an anti-snoring mouthpiece isn’t a good idea. Sleep apnea is a serious condition, and anyone suffering from it should be under a doctor’s care. Even if a snoring mouthpiece can be used to treat mild to moderate sleep apnea, there’s no way for you to know if it will be enough in your case. Only a doctor who’s studied OSA and knows your medical history is qualified to make that determination. Can you breathe through your mouth while wearing an anti snoring mouthpiece? It can be difficult, if not impossible, to breathe through your mouth while wearing some MADs and TSDs. Instead, you usually have to breathe through your nose when wearing these devices. And if you can’t breathe through your nose for some reason (like your nose is stopped up because of a cold) you might have to stop using your snoring mouthpiece for a while. However, if your MAD has air holes, you’ll be able to breathe through your mouth while wearing the mouthpiece. Do I have to be fitted with an anti-snoring mouthpiece? Most Tongue Stabilizing Devices are one-size-fits-all, so there’s no fitting required. You can take your TSD out of the package and start using it immediately. Some Mandibular Advancement Devices can also be used right out of the box. Other MADs can be customized to fit an individual user’s mouth, which usually makes them more comfortable and effective. If you get your MAD from a dentist, the dentist will do the fitting. But other MADs can be custom fit using a “boil and bite” process. “Boil and bite” fitting is something you can do yourself. And, regardless of model or manufacturer, the basic process is the same. Place the MAD in boiling hot water. These oral appliances are usually made of a thermoplastic material that softens when heat is applied to it. Remove the mouthpiece from the hot water and let it cool for a few seconds. You want the MAD to be warm enough to be molded, but not hot enough to burn your mouth. Put the MAD in your mouth and bite down on it. The mouthpiece will mold to the contours of your teeth. Remove the mouthpiece from your mouth and drop it into cold water. Once the mouthpiece has completely cooled, the impression of your teeth will be set. But if you make a mistake, most MADs allow you to repeat the boil and bite fitting process once or twice. Many MADs come with a tool you can use to adjust how much the device advances your lower jaw. And some MADs can be adjusted without tools. The more your lower jaw is advanced, the less likely it is that you’ll snore. However, decreasing the advancement will also decrease any discomfort. Some snorers need more jaw advancement than others to stop snoring. An adjustable mouthpiece allows you to tweak the amount of advancement until your MAD is as comfortable as possible to wear, but still effectively keeps you from snoring. What are anti-snoring mouthpieces made of? Most quality MADs and TSDs are made of a flexible and pliable thermoplastic. This material is soft and rubbery enough for you to wear the mouthpiece comfortably through the night. Good anti-snoring devices are also made of medical-grade materials that are latex and BPA free. How much do anti-snoring mouthpieces cost? The price of these snoring devices varies widely. A snoring mouthpiece you purchase yourself can cost anywhere from $20 to $200. And a mouthpiece from a dentist will cost about $500 to $1000. How long do snoring mouthpieces last? Most anti-snoring mouthpieces will last for about a year with regular use. And some are made to last for two or three years. If you don’t wear your mouthpiece every night, it will last longer. But if, for example, you grind your teeth while you sleep, your mouthpiece will have a shorter lifespan. Can bruxism mouthpieces or sports mouth guards help to stop snoring? If you suffer from a condition like bruxism (teeth grinding) or play contact sports, you’ve probably used a mouthpiece or mouth guard before. And those oral devices might seem very similar to anti-snoring mouthpieces. But, similarities aside, it’s unlikely that these oral appliances will keep you from snoring. Do cheap anti-snoring mouthpieces work? A $10 anti-snoring mouthpiece might seem like a great deal. But a really cheap mouthpiece usually can’t be adjusted or custom fitted, which can affect how comfortable and effective they are. To keep the prices down, cheap mouthpieces are typically made using cheap materials that aren’t medical-grade, latex free, or BPA free. Extremely cheap mouthpieces can also be harder, more rigid and more uncomfortable than higher quality models. How do you take care of an anti-snoring mouthpiece? While some anti-snoring devices have unique care instructions, there are things you can do to keep any oral appliance in good condition. You can use water and a gentle toothbrush to keep most oral devices clean. Read your mouthpiece’s care instructions to see if it’s okay to use toothpaste on the device. Letting your mouthpiece dry completely between uses will help keep germs, fungus and bacteria away. And once the mouthpiece is dry, you can place it in its storage case for added protection. What should I do if my snoring device doesn’t work? First, read the directions again to make sure you’re using the device correctly. Next, if your mouthpiece is adjustable, try increasing the amount that it advances your lower jaw. You might need more advancement in order to stop snoring. But you shouldn’t increase the advancement so much that it causes you pain or acute discomfort. Finally, consider returning your MAD or TSD. Many snoring mouthpiece manufacturers offer money back guarantees, and will give you a refund if you aren’t satisfied with their product. And just because one anti-snoring mouthpiece doesn’t work for you doesn’t mean you won’t have success with another. What should I look for when choosing a snoring device? First, make sure the device has been cleared by the FDA. Next, you want a mouthpiece that’s made of medical-grade materials. It should also be latex and BPA free. Finally, choose a MAD or TSD with a good return policy. If a mouthpiece doesn’t stop your snoring, you should be able to return it in a reasonable amount of time and get a refund. MADs and TSDs are among the most effective remedies for snoring. And, now days, you can find quality anti-snoring mouthpieces to fit any budget. For some people, their snoring happens because of their impaired nasal breathing. If you have a stuffy nose, allergies, deviated septum or a cold that prevents you from breathing through your nose at night then you might be a nose snorer. MAD anti snoring devices won’t help for nose snorers. The best treatment for nose snorers is to rinse your nasal passages at night to clear any mucus. Then use a Nasal Dilator while you sleep to keep your nostrils from collapsing and allowing maximum airflow through your nasal passages. Also, use allergy tablets or spray if you suffer from allergies. One of the most common causes for snoring is the tongue falling back into the throat at night. That causes the airway to be partially blocked. 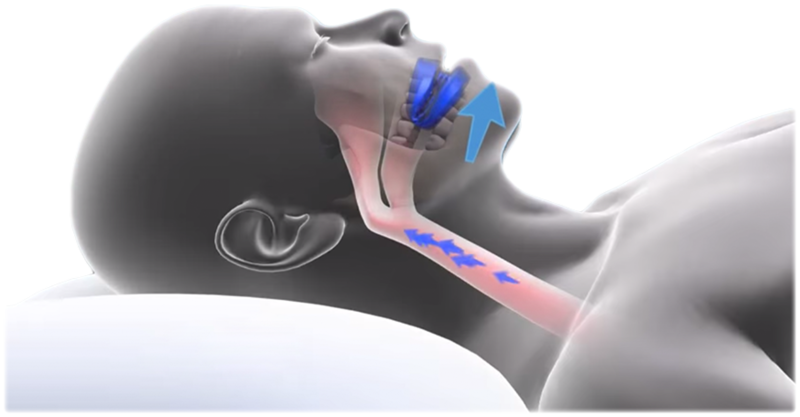 When air forces it’s way through the blocked airway, the tissues vibrate in the back of your throat and produces that gnarly snoring sound. TSD’s work well for this issue. The device looks almost like a baby’s pacifier. When you enter your tongue into the device, it causes a suction effect, which then holds the tongue in place at night and prevents it from falling into the back of your throat and stops the snoring. I recommend using the Good Morning Snore Solution. Some people’s snoring is caused by their mouth falling open at night. That forces them to breath through their mouths and not their noses. Optimum breathing at night should be through your nose. The easy way to fix the mouth from falling open at night is to use a chin strap. There are some good options on the market. One that I like best is the Better Sleep Chin Strap. It is made from advanced neoprene which is almost like wetsuit material. It stays cool at night and does not make you feel restricted. These devices are relatively new to the market and you’ve probably seen them being marketed all over the internet. The problem is that they are getting horrible reviews and for that reason I won’t even recommend one to you here. I do think however, that they might work fine for nose based snorers only. I hope that my anti snoring devices post helped you to get a better understanding of what your options are and how to go about it. If you really want to get rid of your snoring once and for all, then you have to check out my free email course. In this email course I'll help you to discover exactly what it is that's causing you to snore, and how you can stop it in it's tracks. Best of all, it's absolutely free! Fixed! Thanks for pointing it out. Here’s a list of things that could be causing your snoring. 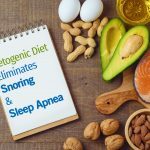 Free Email Course: "How To Stop Snoring Naturally"
This email newsletter will show you the best ways to stop snoring naturally without the need of uncomfortable and expensive devices. Fill out the form to join the newsletter. Affiliate commissions are earned from Amazon Associates and other products recommended on this site.